Web surveys are often the cornerstone of any online research study, either used as a way to screen prospective participants, collect additional data from a board or chat discussion, or further quantify unanswered questions after a focus group. InsideHeads custom designs each web survey and codes it effectively so that security checks are incorporated to ensure the highest quality data. Skilled researchers design unbiased questionnaires and deliver actionable results from statistically significant data sets. I will like to join. You can register to become a member of the InsideHeads Research panel, which will enable us to identify what research studies you may qualify to participate in. Registration is free and easy, just click on the Sign-Up link on this page. Good luck! Are surveys from persons in Jamaica and the rest of the Caribbean valid? Frederick, thanks for your interest! You must register on your own, it’s free and takes only a few minutes, just click on the Sign Up link on this page to get started. 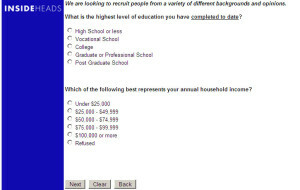 Hi Insideheads, I’m interested in taking web surveys at your company. Is your program available for the Dominican Republic in the West Indies? If so, please let me know how to join. Hi Danielito, thanks for your inquiry. We accept members from all over the globe into the research panel! Simply click on the Join Now link on this page to get started. I have a great interest in your surveys operation and would want to be one of your panelists. 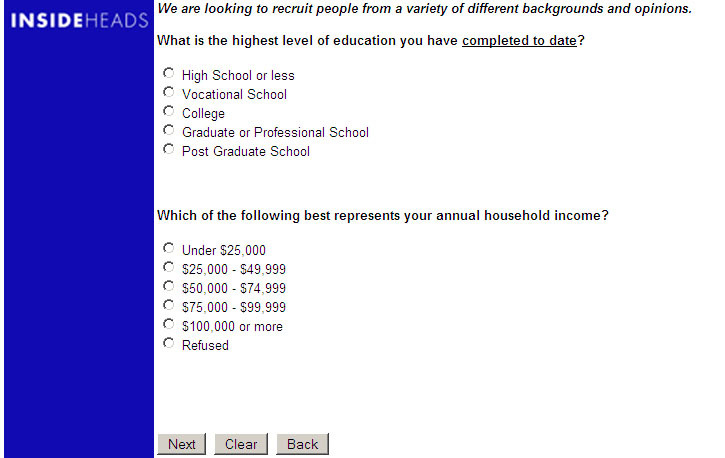 do you get paid for taking online surveys? Can I join to do surveys? Well Harry Henry, your great interest is appreciated. To register as a new panel member, go to this page and select “Join Now” to start the process. Cheers! Hi Edna, we can’t guarantee that you’re going to qualify or be selected for a study, but if your profile looks like a good match for a research study we are doing, we will send you an email with more information. If you do qualify and participate, yes, you will receive money! Registration is easy and free, just go to this page and select the JOIN NOW link. Cheers! Jamar, you can signup here: http://www.insideheads.com/panel, cheers! Hi Santos, I appreciate your time and interest in taking up the research. I hope to place you in a research study soon! Please visit http://www.insideheads.com/panel/ and register yourself. Hi Donna, I appreciate your time and interest for participating in our research. I hope to place you in a study soon! Please visit http://www.insideheads.com/panel/ to join for free. Hi Cristian, Please visit http://www.insideheads.com/panel/ to join for free. Hi Donna, I hope to place you in a study soon! Please visit http://www.insideheads.com/panel/ to join for free. Hi Appiah, I hope to place you in a study soon! Please visit http://www.insideheads.com/panel/ to join for free. How can I sign up for surveys? Hi Janice – Please visit http://www.insideheads.com/panel/ to join for free. I would like to join in your team.taking surveys paid. Hi Analein, to be eligible for InsideHeads studies, join the InsideHeads panel – it’s free and takes just a few minutes! Go to http://www.insideheads.com/panel and select the Join Now button located halfway down the page. Once registered, InsideHeads will send you a confirmation email at first, then as research studies come up, InsideHeads will email you with a link to more information and a screening questionnaire to see if you qualify. If you qualify and participate in a research study with InsideHeads, you’ll receive cash for sharing your time and opinions. Amounts paid vary by study, but will always be clear in the email you receive from InsideHeads. Cheers! Luego de leer la experiencia de otros que han probado y leer al respecto, estoy convencida de que quiero participar en encuestas y generar ingresos que me permitan concretar mis sueños; además de, conocer los distintos tipos de servicios que ofrecen y buscan ofrecer las empresas. I would like to be a part of your survey club. Hi Zaira, thanks for your interest. Have you joined the InsideHeads panel yet? It’s free. Just go to http://insideheads.com/panel/ this page and select Join Now to complete the short online form. Hi Kevin, are you registered as a member of the InsideHeads Research Panel? To be eligible to participate in research studies, go to http://insideheads.com/panel/ and select the Join Now button on the page. It’s free and takes just a few minutes to register. Cheers! Hi Cutell, are you registered as a member of the InsideHeads Research Panel? To be eligible to participate in research studies, go to http://insideheads.com/panel/ and select the Join Now button on the page. It’s free and takes just a few minutes to register. Cheers!